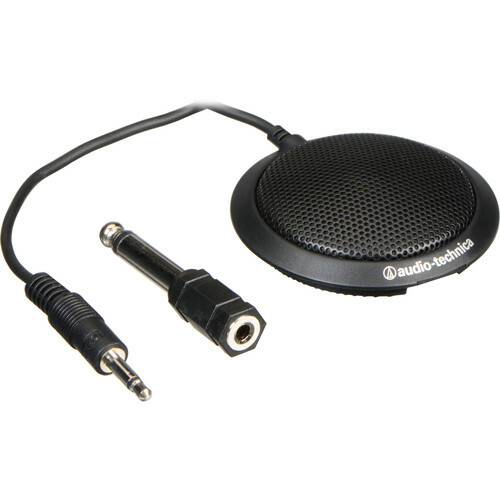 Audio-Technica's ATR4697 Omnidirectional Condenser Boundary Microphone is an economical microphone designed with surface-mounted applications in mind. It has a low-profile and thus keeps visibility to a minimum. The ATR4697 has an omni pickup pattern for full coverage of surrounding audio. A permanently attached 4.9' (1.5m) cable with a 3.5mm mini-plug allows for easy attachment to the source. Box Dimensions (LxWxH) 6.5 x 4.2 x 1.3"
ATR4697 Omnidirectional Condenser Boundary Microphone is rated 3.3 out of 5 by 7. Rated 1 out of 5 by audio2 from You may want to stay away! I tried to use these to record a meeting. You basically have to lift it close to your mouth like a handheld to get any significant volume. The noise floor is also way too high. They also tend to make clicking sounds that I could not get rid of. DO NOT use phantom power even though they are condenser mics. This will cause considerable noise. No indicator to tell if the batteries are low. I can not recommend these mics to anyone. This is certainly one instance where you get what you paid for. Rated 1 out of 5 by K the Sociologist from Poor performance The internal microphone of a Sony PX 312 picked up voices better than this microphone. You have to be very close to it (3 feet or less) to hear recordings. Rated 3 out of 5 by zman from It does what it costs I didn't expect more that it costs to begin with but unfortunately there is nothing between a professional quality mic and not professional. This one definitely is not what a professional mic should be but if you looking just to record audio you can put this on your list. Rated 5 out of 5 by Alex, The Camera Accessory Researcher from So Tiny, yet Powerful Wanted to say that this microphone is exactly what I was looking for. Works Excellent when using Cortana, on Windows 10. Easy to manage, and so small, looks like a giant button hiding. For the price, cannot go wrong. Rated 4 out of 5 by Anonymous from Good Product Microphone is clear and picks up best within a 6 ft radius. People at? larger conference tables need to really speak up. Rated 4 out of 5 by Anonymous from ATR4697 Micophone The micophone work well. The playback is clear. The ATR4697 features a mono 1/8 jack designed for connection to a portable audio recorder. Although the connector is the same size, will not be recognized by a smartphone or tablet.